In 19th century London, a woman weds a doctor with necrophiliac tendencies, and whose first wife died under mysterious circumstances - and might be coming back from the grave to torment her successor. Julia: Your blood will be our life! Antonio Margheriti's "Danza Macabra" aka. 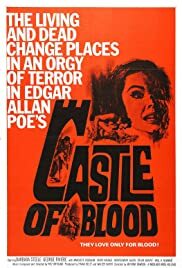 "Castle Of Blood" of 1964 is a beautiful and incredibly haunting masterpiece of Italian Gothic Horror, and after Mario Bava's "La Maschera Del Demonio" (aka. "Black Sunday") of 1960 and Roger Corman's "Pit And The Pendulum" of 1961 (starring the great Vincent Price) another must-see that earned the wonderful Barbara Steele her more than deserved fame as the most important female Horror icon in the history of motion pictures. But not only is the beautiful and brilliant Barbara Steele one of my favorite actresses of all-time, the screenplay to "Danza Macabra" was co-written by no one less than the cinematic genius Sergio Corbucci, who directed such ingenious Spaghetti Western milestones as "Django" (1966) and "The Great Silence" (1968). Italy's number 2 in the field (right after Mario Bava), Director Antonio Margheriti is one of the all-time masters of Gothic Horror, and "Castle of Blood" is doubtlessly his greatest achievement. Hardly another film works so brilliantly in creating an incredibly haunting, yet beautiful atmosphere as it is the case with this creepy masterpiece.